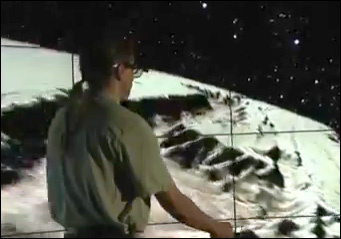 EVL invented the original CAVE in 1992 (http://youtu.be/-Sf6bJjwSCE) using cathode ray tube projectors. And it was considered a paradigm shift in virtual reality, moving people away from big heavy VR helmets to light weight LCD shutter glasses. People likened the CAVE to the Holodeck. Objects in the room appear to materialize as if they were real, except of course you can't touch them. Fast forward to today and CAVE2- the next major leap forward for the CAVE. CAVE2 leaves behind dim projectors for bright near-seamless 3D LCD panels, and at the same time giving us almost 10 times the resolution of the original CAVE. CAVE2 is built from 72 LCD panels, 36 computers connected to a 100 Gigabit/s optical network, and uses 10 cameras for viewer-centered perspective tracking, and 20 speakers for ambisonic sound. The project was funded by the National Science Foundation and the Department of Energy. CAVE2 will be used in a variety of applications to visualize large scale data in scientific research, engineering design, medicine, education, simulation training, art, and video game design. CAVE2 will also be used to develop new data visualization and user-interaction techniques.